Karlson Flies Again Oxford Smidge is used to Karlson, the funny little man with a propeller on his back, living on the roof. They are firm friends. Now, anytime Karlson pops in, Smidge knows that there's fun and adventure in store. 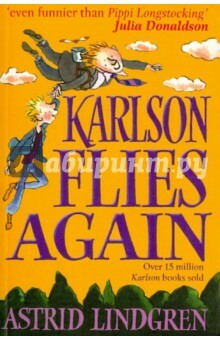 Аннотация к книге "Karlson Flies Again"
Smidge is used to Karlson, the funny little man with a propeller on his back, living on the roof. They are firm friends. Now, anytime Karlson pops in, Smidge knows that there's fun and adventure in store. Если вы обнаружили ошибку в описании книги "Karlson Flies Again" (автор Astrid Lindgren), пишите об этом в сообщении об ошибке. Спасибо!